Dive even deeper into the music world with MAGIX Music Maker 2014 Premium. More premium instruments, tons of studio effects, expanded functionality, and even more sounds and loops provide everything you need to create your own amazing tracks. Produce your own tracks in your own style. With soundpools that can be combined, Vita Solo Instruments and the new DN-e1 synthesizer, there’s no limit to how creative you can be. Virtual instruments: Power Guitar*, Electric Piano, Vintage Organ, Pop Brass, Drum Engine, Jazz Drums, BeatBox 2, Vita 2 Sample Player, Revolta 2 Synthesizer. 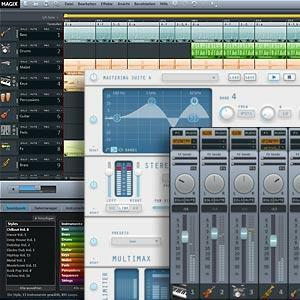 The recording function in MAGIX Music Maker 2014 Premium has been reworked and simplified. Record your vocals or an instrument such as guitar, bass or keyboard on one track and move on with ease to record the next one. With the addition of Vocal Tune to MAGIX Music Maker 2014 Premium, the program now has a powerful tool for editing pitch. Push It to the Limit. Mix and Master. Thanks to the integrated mixer and studio-quality effects all of your songs will have real hit potential. And there’s no limit to the number of tracks you can use. Exclusively in the Premium Version: Mix and export your own songs and albums in genuine 5.1 Surround Sound. Mastering is one of the most demanding and specialized aspects of music production and requires extensive experience with the perception of sound. Now, thanks to the new Auto Mastering feature, anyone can achieve impressive results. Mastering Suite 4 provides a professional platform for editing your music and is guaranteed to deliver excellent sound and amazing results. *Power Guitar is offered as a free download after program installation. There are 10 different Soundpools. MAGIX Music Maker 2014 Premium features over 5000 new loops and sounds from the genres of Rock Pop, Hip Hop, Dance, Techno, Chillout, Dubstep, House, Metal, Electro, and Movie Score. An additional 1000 top sounds are available as a free download. Mix and export your own songs and albums in genuine 5.1 Surround Sound. Thanks to the integrated mixer and studio-quality effects all of your songs will have real hit potential. And there’s no limit to the number of tracks you can use. Soundpool DVD Collection 18 is included and has over 6000 additional sounds and loops. The Soundpool DVD Collection covers virtually all music genres and offers professional studio-quality sounds. Drag and drop loops to achieve amazing results in no time at all. You can also easily share your songs with friends. Save songs as MP3s, burn to CD, or post directly on Facebook, SoundCloud & YouTube. The recording function in MAGIX Music Maker 2014 Premium has been reworked and simplified. Connect a microphone, guitar, or keyboard and create your own songs in studio quality.